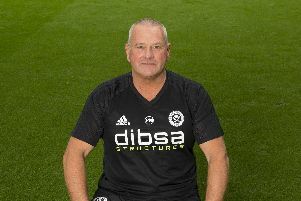 Nigel Clough has issued Marc McNulty with a fresh challenge after telling the Scottish centre-forward he still has plenty to prove before commanding a permanent place in Sheffield United’s starting eleven, writes James Shield. Clough made the claim despite acknowledging the 22-year-old had delivered a near perfect display during last weekend’s FA Cup success over Queens Park Rangers. McNulty scored the first of United’s three goals at Loftus Road but Clough, asked whether the summer signing from Livingston is ready to spearhead his attack, warned: “I don’t think he has quite got it. But you only get that building up your fitness. “If he keeps getting knocks or being ill, it is difficult to start him every week. Even to leave him on 90 minutes. United, who have been paired with Preston North End in the fourth round draw, return to League One action when Simon Grayson’s third placed side visit Bramall Lane tomorrow. Although McNulty, who has scored nine goals so far this term, arrived in South Yorkshire eight months ago, he trained regularly with Clough’s squad before leaving Almondvale Stadium on a permanent basis. “When Marc comes on, he looks a threat as well,” the United manager added. “He’s been hampered by one or two injuries and off the field incidents and everything. With negotiations aimed at securing Chris O’Grady’s release from Brighton and Hove Albion still ongoing, McNulty is expected to compete with Michael Higdon and Jose Baxter for the right to lead United’s charge against North End. Clough’s team, ranked sixth despite failing to win any of their last six league outings, drew 1-1 at Deepdale in August.